Oklahoma Modern: Is the Page Belcher Federal Building worth saving? 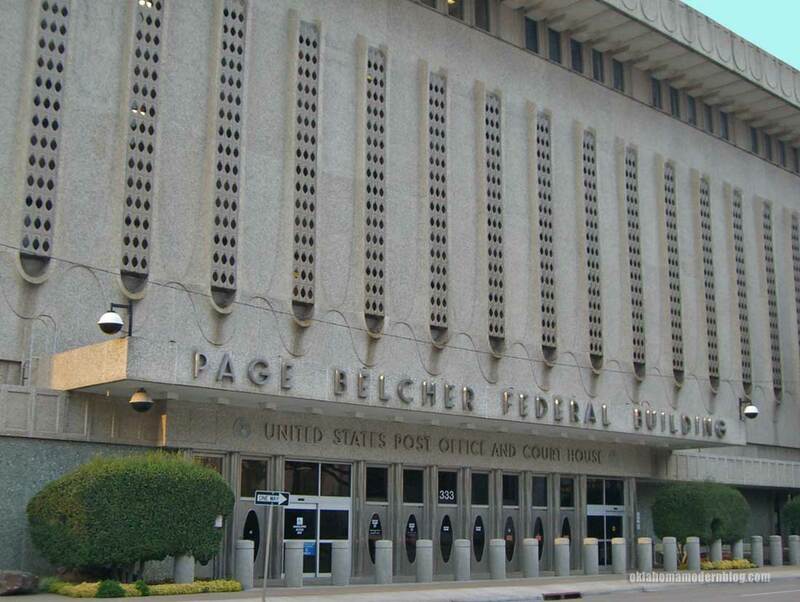 Is the Page Belcher Federal Building worth saving? There is a possibility that in several years the Page Belcher Federal Building might be vacant. In the event that happens an obscure city commission wants the building gone. Or if not removed, at least re-skinned. It was mentioned the building looks "out of place" compared to the BOK Center. I almost found that amusing. Next to the stainless steel skin of Pelli's arena it's hard for me to picture what might not look out of place. An aluminum dirigible? Or maybe a four-story mockup of a food processor? But there's nothing amusing about the Council's intentions. They appear to be poised to level the 1967 structure to make way for something less out of place. At a meeting last October several people voiced their opposition to the idea of tearing it down- which seemed to surprise the council. It's no secret that plenty of Tulsans think the building is an eyesore. I mean even the name is a handicap! Many like to compare the Page Belcher to the previous Federal Building at 3rd and Boulder. That ornate structure was built in 1928 and has columns like any respectable post office should. 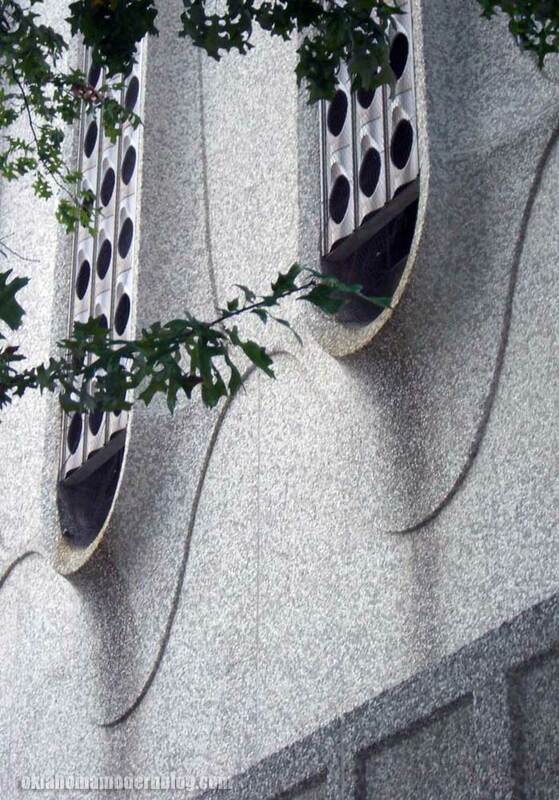 Those folks have a hard time understanding that simply adding ornamentation does not make a building grand. In recent years there have been some updates to the Page Belcher building that weren't exceedingly kind. 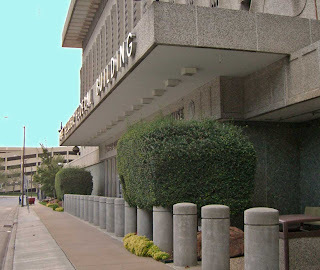 Concrete barriers were added after the bombing of the Murrah Building. Some of the doors with that cool oval window have been removed to add accessible sliding doors. But I have always liked the scalloped facade and aluminum screens running up the sides. The green granite walls of the ground level and terrazzo floors certainly seem plenty business-like to me. And I don't care what anyone says- it looks just fine next to the BOK Center. There's a rumor that Tulsa's Federal Building was built upside down. Seriously. I've heard this from several sources. I don't know if it's true- but the ornamentation on the sides of the Page Belcher Federal Building would certainly shed rain better if they were turned over! The scallop designs have a cup-shaped bottom that birds love to nest in and collects water. The top of each scallop is open and begs the question- are they upside down? This photo shows the stains from rain collecting in the scallops. The story goes that these were supposed to be at the top of the building with the open end facing down. By the time someone noticed it was too late and the construction continued. So what do you think? Are they really upside down? Or is it just an urban legend? When you have city planners/ decision makers that have a Wal-Mart cloned brain and expect architecture to look like a track house, they don't get it. If the city commission really wants to be critical of development in downtown Tulsa, they should level the brand- new, cheap, tacky, tract home, apartment community that is just one block from this building. They took no consideration for site planning and urban architectural sensitivity with THAT project. If the brise-soleil is collecting water and a nuisance for nesting birds, drill a drain hole or fill the scallops that are collecting water with a plasticized cement for drainage, then put a simple wire screen or spikes to prevent birds from nesting. The level of stupidity and lack of common sense of current American city planners & decision makers never ceases to amaze me. On a side note, the city is going further and further in debt because of the idiotic decision to put all of the city offices in the glass Williams building downtown. They can pay hundreds of thousands of dollars for the electric bill every month for that building, but can't come up with a solution that would cost the price of a cheap car to fix this building. 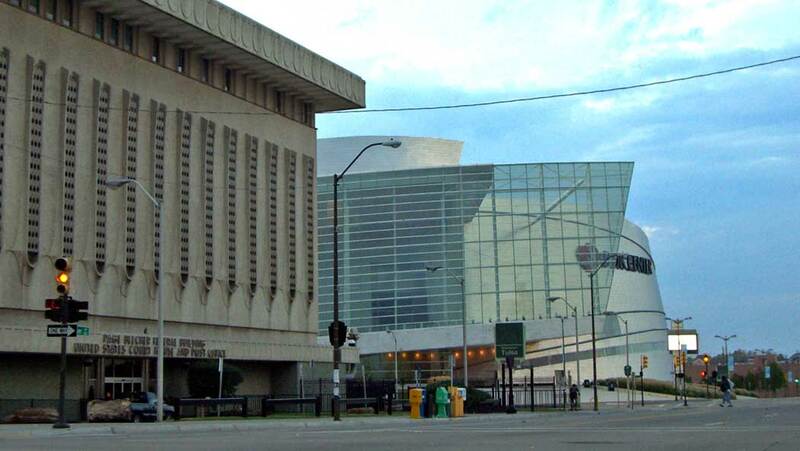 I would like to see someone demolish the Page Belcher building without seriously damaging the BOK Center. You would have to see its construction to believe it. The BOK Center is a house of cards in comparison. You are asking for trouble. The PBB was here first, perhaps the BOK Center should have been designed to fit into existing architecture . . not match it . . . hust compliment it. The BOK Center's present site was ill-conceived and not close to other entertainmnet venues. Has anyone heard? . . . the federal government has no more money for these types projects just to satisfy someone's hunger for architectural harmony. By the time the federal government finds the money for a new courthouse, the BOK Center will have outlived its usefullness and be on its own demolishtion schedule!